Rex Art Gift Sets | Everything you need for a Great Gift this Holiday Season! Holiday Spotlight at Rex - Rex Art Gift Sets! The Rex Art Gift Sets are back and better than ever for the 2010 Holiday Season! 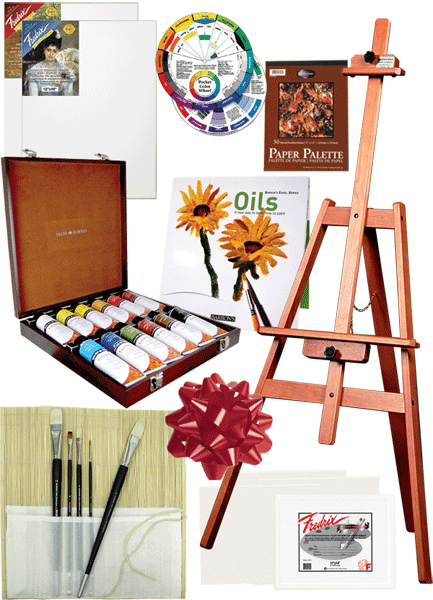 At Rex Art we know that giving an art supply gift can be a daunting task. What brushes should I get? I need an easel, if so, which one is good? What type of paper should I get for drawing? How many and what type of paint should be used? What airbrush is best to start with? These questions and many others are the typical questions we get every Holiday Season from the average person that wants to give a great artistic, and creative gift, but they do not know what to get or even where to begin. First, we understand, and we are here to help you give a fantastic gift in almost any media whether it is oils, acrylics, watercolor, drawing, etc. Without further delay check out our Rex Art Gift Sets – Problem solved! The Rex Art Oil Painting Gift Set - Everything you need to give a fantastic gift! All of our Rex Art Gift Sets are custom assembled here at Rex Art. We only use the best products hand selected from our massive inventory of creative products. These sets are superior because we choose the components individually, and we only include the best of the best of our products in each media, which meet our strict criteria of quality, functionality, and value! 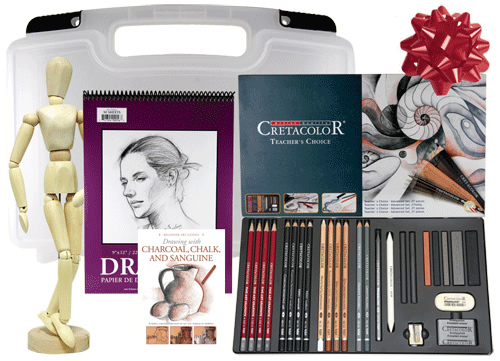 The Rex Art Drawing Gift Set - Everything you need to give a fantastic gift! You are going be as thrilled to give our Rex Art Gift Sets as much as the person will be to receive them. If you have any questions please do not forget we are always a phone call, 800-REX(739)-ART2(2782), or email away. There are no stupid questions and we are always happy to help you solve your artistic gift giving dilemmas. As always our family at Rex thanks you for your support. From our family to yours, we wish you a joyous, healthy, and safe holiday season! Thank you for your interest in our Rex Art Drawing Kit. The reason you cannot find it locally is because we produce this kit as a custom item, and it is only available from Rex Art Supplies. The minimum shipping costs for even the smallest and lightest shipments abroad are $25 – $35. Once your order and paperwork have been received we can quote you actual cost freight options. Please also note that our on-line prices do not include any import duties that are imposed by your country, and are in US dollars. Want to be notified about upcoming classes at Rex Art? Enter your email address below and we'll keep you up to date on our classes. Ready Made Frames Now Available @ REX! Syfys FACE OFF | Now Casting!! !